Whether your tired old rear axle is on its death bed or you simply want to upgrade your off-road prowess, this article will show you how to get it done. First things first, let's get this out of the way: power from the engine goes through the transmission, then through the driveshaft, sending that power to the rear differential, and finally to the the axle, which then turns the rear wheels. Driveline components are rugged, but are not indestructible. After many years of faithful service, things begin to wear out. The most common weak spot on the 4Runner's drivetrain is the rear axle, meaning the differential and solid axle unit. Has your rear suspension began to make groaning, clunking or clicking sounds? Your axle may be on its way out. If you've upped the amount of power going through the driveline, tow or off-road regularly, it may be worth your while to upgrade the rear axle to a more durable unit. Different axles come with different upsides and downsides, so rear up on these options and pick which one is right for you. Ford rear axles are legendary for their strength and ability to handle torque. Because they have been used in so many car models over the years, they are also widely available and cheap. The 9" rear that was used in the 1976 to 1977 Bronco is the same width as an IFS Toyota rear end, making it a pretty straightforward swap. This particular rear has bigger brakes than the Toyota (11") and a stronger housing. It is, however, a five lug bolt pattern (meaning you might have to swap the front as well to get matching wheels), and an open differential. The width of an 8.8" rear end is pretty close to a stock Toyota unit, and they are still in use in the Mustang, Explorers as well as Rangers. Parts for the 8.8, like the 9", are cheap and plentiful if you want to beef them up. In stock for both are pretty strong and feature lower gearing (for better low end acceleration), but parts are available to make them nearly bulletproof. Figure 1. 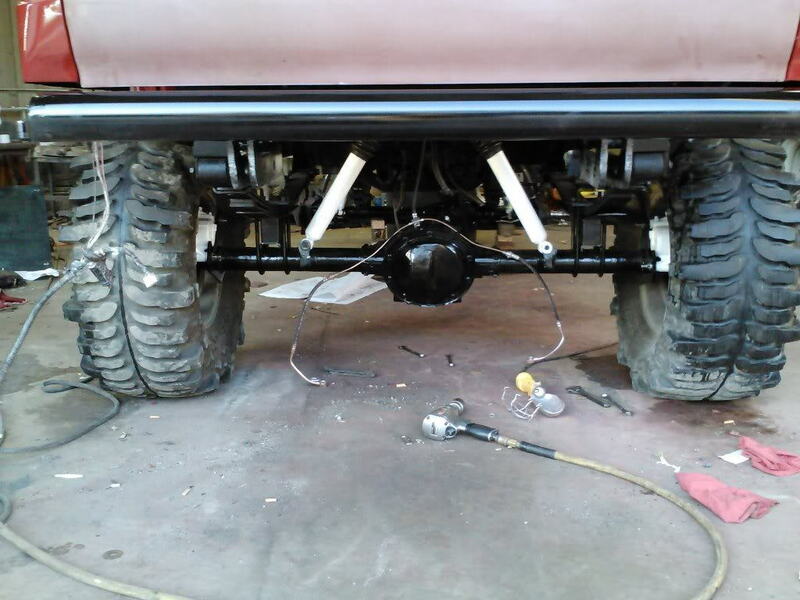 A Ford 9" rear axle installed on a 4Runner. For those who get queasy at the thought of turning their 4Runner into a Frankenstein-like miss mash of parts and want to keep their Toyota all Toyota, there is another option. The Supra, namely the MK3 Turbo model, provides a nice fit and a huge upgrade in performance potential. These differentials come with a nice 3:73:1 rear gear from the factory, and the locking nature of the diff means you won't be spinning one tire at a time. If you intend to put some serious horsepower under your hood, there are numerous performance upgrades available for the Supra rear axle as well. With some Supra's out there making 1,000+ horsepower, strength is not a problem here. Perhaps the best news is that you can even swap over your stock brakes to the new unit, saving a bunch of money in the process. The only real downside is the Supra axle is around 1" shorter, so if you're running anything other than stock wheels and tires, you might get some rubbing against the bed. This can be fixed by installing a wheel spacer or installing longer studs in the axles. Figure 2. 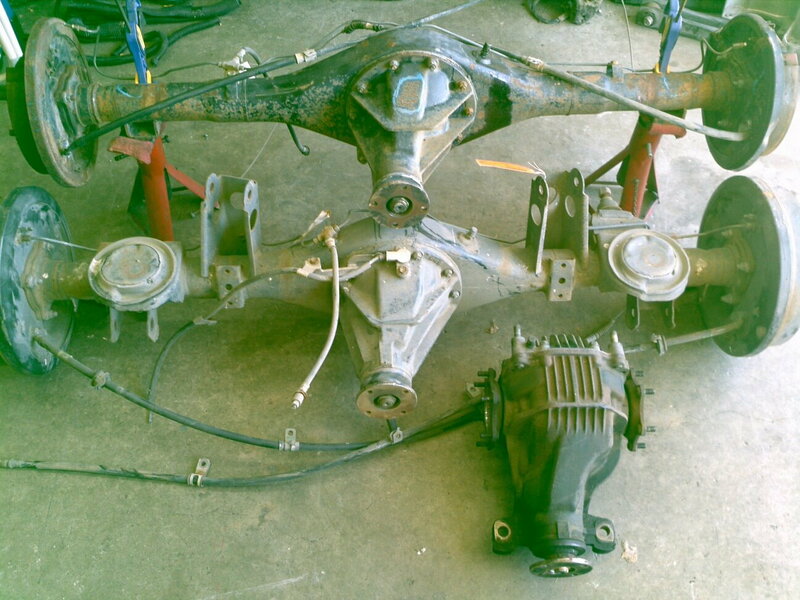 A Supra rear end compared to a stock 4Runner rear end.